I N J U S T I C E documents the horrific loss of life at the hands of the state and it’s attempts to cover up these killings. 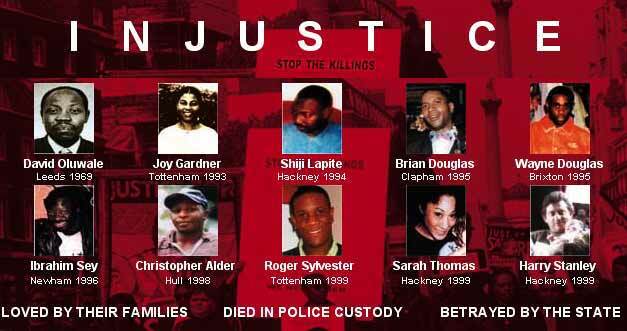 The British police have been responsible for hundreds of deaths and have walked free.The families of the dead want justice and they will not stop until they have got it. Winner Best Documentary – BFM London Film Festival 2002, Winner National Social Justice Award 2003, Winner Best Documentary (Human Rights) – One World Film Festival 2003, Winner New Nation Campaign group of the Year 2004. ‘INJUSTICE’ was first released in 2001 and at the time the police tired to ban its release. All I feel right now is absolute rage. Rest In Peace to all those who lost their lives unlawfully in police custody. I actually went to a special screening of this and met the maker and the two sisters of Sean Riggs who was killed in police custody, very very powerful and sad to watch. Looks interesting. Might have to watch before bed.